Fortune's Allan Sloan takes a look at the troubled retirement program, why it's more important now than ever - and how lawmakers can repair it. 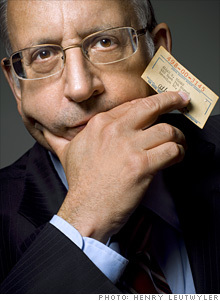 The author Allan Sloan with his Social Security card. No, that's not his real number. Its problems dwarf Social Security's, but President Obama expects to fix the government's medical plan as part of the health-care overhaul. When it comes to problems, Medicare makes Social Security look like a walk in the park, even though at about $510 billion this year, it's far smaller. Not only are Medicare's financial woes much larger than Social Security's, but they're also much more complicated. You solve Social Security's problems by reducing future payments below where they'd otherwise be (which is what raising the retirement age does), or you bring more revenue into the system than it would otherwise have, or some combination of the two. Medicare is more convoluted, because the health-care system is much more complex than Social Security. Which, when you think about it, involves only money. Medicare presents several touchy issues, one of which is what to do about horrendously costly end-of-life problems, which account for a huge proportion of our national medical bill. Do you ration end-of-life care? Do you decide that the cost of having a comatose patient live another few weeks is too high and order care discontinued? Who wants to be responsible for making those decisions? Certainly not me. The Obama folks say they'll solve Medicare's problems as part of fixing the health-care system. Then it will be Social Security's turn. --A.S.
(Fortune Magazine) -- In Washington these days, the only topics of discussion seem to be how many trillions to throw at health care and the recession, and whom on Wall Street to pillory next. But watch out. Lurking just below the surface is a bailout candidate that may soon emerge like the great white shark in Jaws: Social Security. Perhaps as early as this year, Social Security, at $680 billion the nation's biggest social program, will be transformed from an operation that's helped finance the rest of the government for 25 years into a cash drain that will need money from the Treasury. In other words, a bailout. I've been writing about Social Security's problems for more than a decade, arguing that having the government borrow several trillion dollars to bail out Social Security so that it can pay its promised benefits would impose an intolerable burden on our public finances. However, I've changed my mind about what "intolerable" means. With the government spending untold trillions to bail out incompetent banks, faddish mortgage borrowers, General Motors, Chrysler, AIG (AIG, Fortune 500), GMAC (GJM), and Wall Street, it should damn well bail out Social Security recipients too. But in a smart way. Unlike the pigs feeding at Uncle Sam's trough, the people who qualify for Social Security old-age benefits -- the ones who'll benefit from the bailout -- have played by the rules and paid Social Security taxes for decades. It would be immoral to tell them, "Sorry, we have to trim your cost-of-living adjustment because we can't afford it," while expecting them to continue footing the bill for bailing out imprudent people and institutions. Why am I talking about Social Security when health care is sucking up virtually all the oxygen in Our Nation's Capital? Because Social Security is a really big deal, providing a majority of the income for more than half the people 65 and up, and also supporting millions of disabled people and survivors of deceased workers; because the collapse of stock prices and home values makes Social Security retirement benefits far more important even to upscale baby boomers than they were during the stock market and home-price highs of a few years ago; and because the problems aren't that hard to solve if we look at Social Security realistically instead of treating it as a sacred, untouchable program (liberals) or a demonic plot to make people dependent on government (conservatives). Finally, this is a good time to discuss Social Security because the Obama folks say it's next on the agenda, after health care. No one at the White House, Treasury, or Social Security Administration would discuss specific Social Security proposals, however. It ought to tell you something that Peter Orszag, director of the White House Office of Management and Budget, is a noted Social Security scholar. He's co-author of an influential 2004 book, Saving Social Security: A Balanced Approach, that advocated substantial tax increases (and a few benefit trims) to preserve the program. Alas, he wouldn't tell me what he plans to propose this time around. "Health care first" was all he'd say. Meanwhile in Congress, Rep. Steny Hoyer (D-Md. ), the House majority leader, says he intends to deal with Social Security as soon as possible. But he also declined to be specific. "I've been more inclined toward a commission" than to introduce legislation, he said. That makes this a good time -- and maybe our last chance -- to have a rational conversation about Social Security. After proposals start getting leaked and the game-playing and finger-pointing start, it won't be possible. So I'd like to show you that Social Security has a real and growing cash problem even as its trust fund is getting bigger than ever, explain how the program really works, and -- immodest though it may seem -- propose a few simple solutions to fix it, restore it to its roots, and make its finances less incomprehensible. How can Social Security possibly need a bailout when by Washington rules it's "solvent" for another 26 years? To understand the problem, all you have to do is look at me. I'm the distinguished -- okay, old -- guy above and to the right, holding an ancient (but real) Social Security card that Fortune's photo mavens have doctored to display an invalid number (so don't try using it). I'll turn 66 near the end of next year, making my wife and me eligible for full Social Security benefits. They'll be about $42,000 a year starting on Jan. 1, 2011, and are scheduled to rise as the consumer price index rises. Social Security, which analyzed my situation at Fortune's request, values those promised (but not legally binding) benefits at a bit more than $600,000. In other words, that's how much Social Security would have to set aside today to pay benefits to my wife and me, assuming that we live out statistically average lives, and that the current benefit formula stays in place. Even though 600 grand is a lot of money, Social Security is way ahead on my wife and me because the value of our benefits is far less than the Social Security taxes we and our employers will have paid by the end of next year, plus the interest Social Security will have earned on that money in the decades since we started working. Those taxes and interest will have totaled more than $800,000 by Dec. 31, 2010. For example, the $5.18 my employer and I paid in 1961 -- the year I got that card I'm holding -- will have grown to $140 by the end of next year. I don't have a problem with this $600,000-to-$800,000 disparity, by the way. One of the principles of Social Security is that higher-paid folks like me -- I'll get the maximum old-age benefit because I earned the maximum Social Security-covered wage (currently $106,800 a year) for 35 years -- support the lower paid. That's as it should be, given that the Social Security tax (12.4% of covered wages, split equally between employer and employee) is regressive, far more costly as a percent of income to a $40,000-a-year person than it is to me. According to the Tax Policy Institute, five out of six U.S. workers pay more in Social Security tax (including the employer's portion) than in federal income tax -- something that makes it especially important (and only fair) to preserve the program for lower earners, who get old-age benefits of up to 90% of their covered wages, while I get only 28%. How can my wife and I pose a problem to Social Security when our benefits are valued at $600,293, while our tax payments ($271,508 through next year) plus interest will total $804,686? Answer: because the obligation is real, but the $800,000-plus asset is illusory, consisting solely of government IOUs to itself. Now let's step back a bit -- to 1935, actually -- to see how we got into this mess. Franklin Delano Roosevelt set up Social Security to look like an insurance company and a funded-benefit program, even though it's neither (a point, by the way, that Fortune made almost 75 years ago, in our December 1935 issue). No, it's not a Ponzi scheme as some folks claim. A Ponzi uses money from today's investors to pay yesterday's investors and -- the key element -- lies about it. Social Security, in contrast, doesn't lie about what it is: an intergenerational social-insurance plan, with today's workers supporting their parents (and disabled and survivors) in the hope that their children will support them. It's not a pension fund. It's not an insurance company. Social Security exists in its own world. In this world taxes are called "contributions," though they're certainly not voluntary. "Trust funds," which in the outside world connote real wealth bestowed on beneficiaries, are nothing but IOUs from one arm of the government (the Treasury) to another (the Social Security Administration). And "solvency," which in the real world means that assets are greater than liabilities, means only that the Social Security trust fund has a positive balance. Alas, the trust fund is a mere accounting entry, albeit one with a moral and political claim on taxpayers. It's Social Security's cash flows, not its trust fund, that will determine what the system can actually pay. It's really a pay-as-you-go system, its trust fund notwithstanding. To understand why I say that Social Security will soon need a bailout while most people say everything's fine through 2035, we have to examine the trust fund. It currently holds about $2.5 trillion of Treasury securities and is projected to grow to more than $4 trillion, even as Social Security begins to take in far less cash in taxes than it spends in benefits. For instance, in 2023 it projects a cash deficit of $234 billion. However, the trust fund will grow because it will get $245 billion of Treasury IOUs as interest -- the Treasury pays its interest tab with paper, not cash. "The trust fund has no financial significance," says David Walker, former head of the General Accountability Office and now president of the Peterson Foundation, which advocates fiscal responsibility. "If you did [bookkeeping like] that in the private sector, you'd go to jail." Let me show you why the Social Security trust fund isn't social or secure, has no funds, and can't be trusted, by returning to my favorite subject: myself. The cash that Social Security has collected from my wife and me and our employers isn't sitting at Social Security. It's gone. Some went to pay benefits, some to fund the rest of the government. Since 1983, when it suffered a cash crisis, Social Security has been collecting more in taxes each year than it has paid out in benefits. It has used the excess to buy the Treasury securities that go into the trust fund, reducing the Treasury's need to raise money from investors. What happens if Social Security takes in less cash than it needs to pay benefits? Watch. Let's say that late next year Social Security realizes that it's short the $3,486 it needs to pay my wife and me our Jan. 1, 2011, benefit. It gets that money by having the Treasury redeem $3,486 of trust fund Treasury securities. The Treasury would get the necessary cash by selling $3,486 of new Treasury securities to investors. That means that $3,486 has been moved from the national debt that the government owes itself, which almost no one cares about, to the national debt it owes investors, which almost everyone -- and certainly the bond market -- takes very seriously. Think about this for a second. The Treasury has to borrow money to make good on the Social Security trust fund's obligations. Remember that the Treasury and Social Security are both part of the government. This example shows you that the trust fund is of no economic value to the government as a whole (which is what really matters), because the government has to borrow from private investors the money it needs to redeem the securities. It would be the same if the trust fund sold its Treasury securities directly to investors -- the government would be adding to the publicly held national debt to fund Social Security checks. See? The trust fund isn't a savings vehicle -- it's nothing but a bookkeeping entry. If you look at the "Social Security cash flow" chart, above and to the right, you'll see that Social Security's projected annual cash-flow deficit starts small but grows quickly to 12 digits. It's like having an AIG every year, then two AIGs, then more. It's simply unsupportable. You won't find anything like our chart in Social Security's annual trustees report -- we used information from a special online version of a table buried on page 196 of this year's 222-page report. Social Security's "solvency" calculations -- and the insistence by the status quo supporters that there's "no problem" until 2036 because the trust fund will have assets until then -- assume that the Treasury can and will borrow the necessary money to redeem the trust fund's Treasury securities. They also assume that our children, who by then will be running the country, will allow all this money to be diverted from other needs. I sure wouldn't assume that. This whole problem of Social Security posting huge surpluses for years, using proceeds from a regressive tax to fund the rest of the government, and then needing a Treasury bailout to pay its bills is an unanticipated consequence of the 1983 legislation that supposedly fixed Social Security. In order to show 75 years of "solvency," as required by law -- a law that should be changed -- Congress, using the bipartisan 1983 Greenspan Commission report as political cover, raised Social Security taxes sharply, cut future benefits, and boosted the retirement age (then 65, currently 66, rising to 67). That was the first such step-up in retirement age, even though life spans have increased greatly since Social Security was founded in 1935, when someone who reached 65 really was old. The changes transformed Social Security from an explicitly pay-as-you-go program into one that produced huge cash surpluses for years, followed by huge cash deficits. No one in authority seems to have realized that the only way to really save the temporary surpluses was to let the trust fund invest in non-Treasury debt securities, such as high-grade mortgages (yes, such things exist) or corporate bonds. That way, interest and principal repayments from homeowners and corporations would have been covering Social Security's future cash shortfalls, rather than the Treasury's having to borrow money to cover them. This problem has been metastasizing for 25 years. Now I'll show you why the day of reckoning may finally be here, using numbers to back up my earlier assertion that Social Security could go cash-negative this year.